Strummed Acoustic sounds superb, plays easily and boasts a high level of flexibility (and, consequently, longevity) thanks to its seamless pattern and chord changing. Recommended. Plays easily. Excellent sounds. Flexible in application. Seamless chord changes. A 1973 Martin D-35 acoustic guitar was deeply multisampled to create Native Instruments' Session Guitarist - Strummed Acoustic - an 8GB generator of strummed riffs and rhythms for Kontakt and Kontakt Player. 102 patterns are grouped across 31 'songs', but each of its eight keyswitched slots can be loaded with any one of them. The gamut of acoustic guitar styles is covered, and the library "does not employ traditional timestretching, but is based on a far more sophisticated technical backbone and recordings in multiple tempos". And it's paid off, as Strummed Acoustic sounds convincingly 'real' at anywhere from around 60-200bpm (depending on the Pattern). "Impressively, high and low voicings have been captured for every pattern"
Selecting patterns is done in the Pattern Browser, which has filters for playing/sound characteristics (Open, Muted, Mixed, Hard and Soft) and rhythmic base (3/4, 4/4, Triplets), plus Similar pattern and Rhythm Search functions to put specific pattern styles at the top of the list. Strummed Acoustic divides the keyboard up into Pattern keyswitches, Endings, Pickups and the three-octave note/chord playing area. 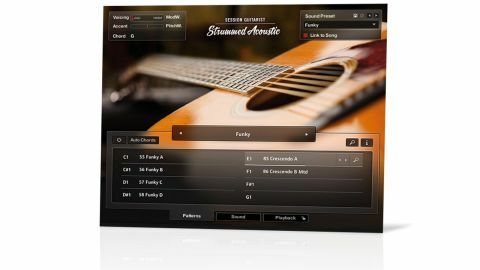 Pretty much any chord you can throw at it is recognised, and an easy-to-use Auto Chords mode is available for one-fingered play. Transitions between chords and patterns are always perfectly in sync with the playback position, while the Endings and Pickups offer various one-shot strums and palm hits for playing at the ends of patterns or in transition between them. There are also Swing and Humanise controls for dialing in feel, pitch wheel control of accent level, and a fret noise volume knob. Impressively, high and low voicings have been captured for every pattern, with the mod wheel used to set the mix between them. Each voicing also includes a Doubling option alongside the regular Stereo mode, for a big double-tracked sound. Basic sound-shaping is on hand, too, in the shape of EQ, compression and reverb.